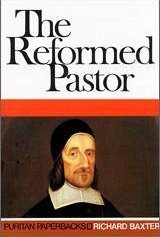 Over the past few weeks I have been devouring Richard Baxter’s The Reformed Pastor, and I have loved it. I would place it in my top five theological books of all time. Probably the greatest thing that I gotten from the book is a deeper sense of the difficulty, height, and importance of pastoral ministry, and the corresponding need for personal holiness in those who seek it. By the time you finish the book you have to gulp and say, “wow, pastors are called to nothing short of fighting for eternal souls – we had better be diligent and focused in our task.” For those in pastoral ministry, or considering entering pastoral ministry, its a very helpful book for stimulating godliness and earnestness and prayer. Other things that stood out to me: (1) its well-written and clear and eloquent; (2) the structure of the book is insightful – he devotes the first major section of the book to self-oversight, and the second major section to the oversight of the flock, again highlighting the importance of discipline and personal godliness among pastors; (3) I appreciated Baxter’s emphasis on the priority of the conversion of souls as an aim of pastoral ministry, as an expression of compassion on the terrible fate that those who do not know Christ will suffer upon death. My thought is often, “first, pastors should disciple the flock, and then, if they have time, do some evangelism on the side.” Baxter’s emphasis on the need for compassion on dying souls was refreshing; (4) I appreciated (and was challenged by) Baxter’s emphasis on the importance of works of charity. As he puts it, “stretch your purse to the utmost, and do all the good you can” (66). A very challenging and helpful book – I recommend it.